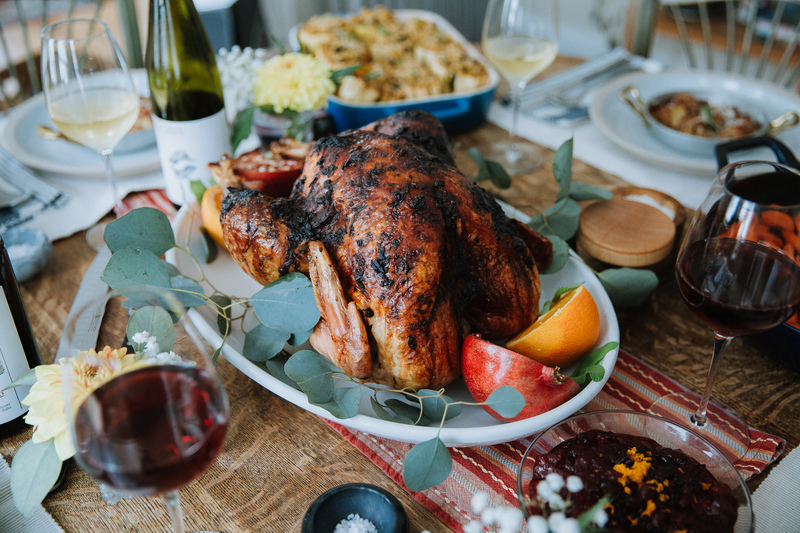 We have cooked a lot of Thanksgiving dinners over the years, from casual Friendsgiving to full-blown feasts for the whole family. 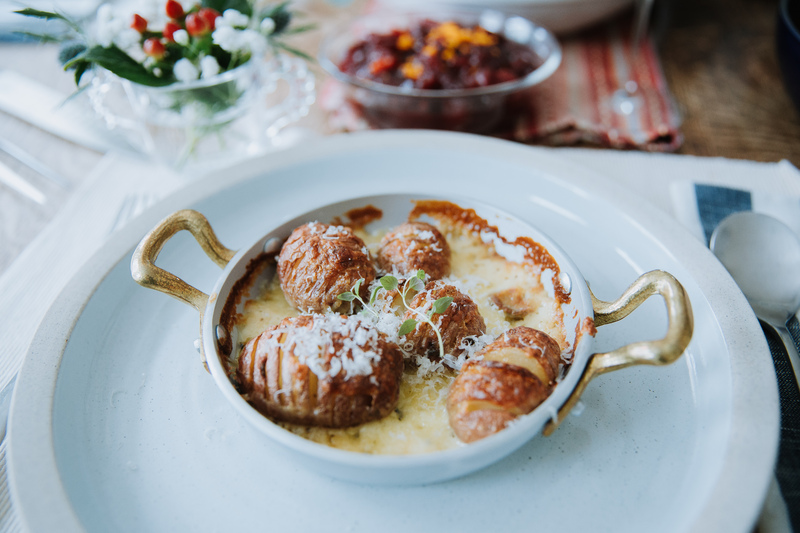 We’ve gained a bit of experience from our successes and failures, and have put together some tips to help you get through the day to deliver a delicious, stress-free meal. 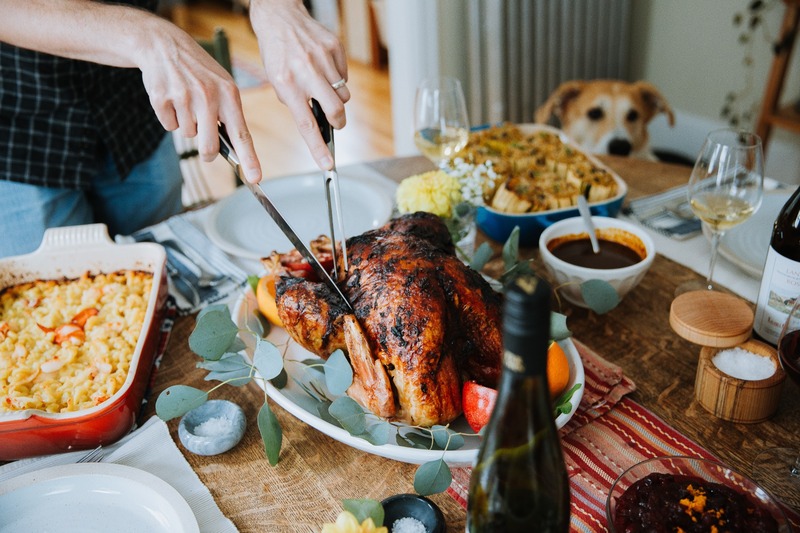 With so much work going into this one day, we find it helpful to plan ahead and complete as many tasks ahead of Thanksgiving Day as possible. 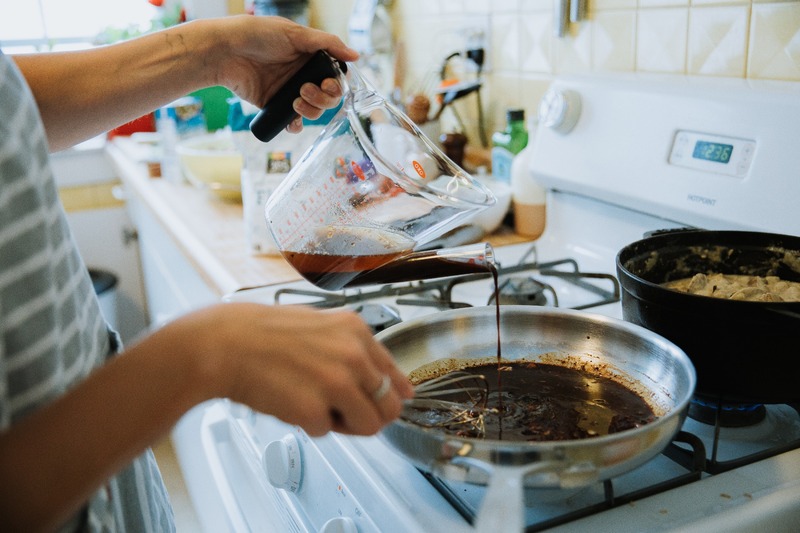 These include planning your menu, shopping for non-perishable ingredients, prepping any dishes that can made ahead of time, and setting the table the Wednesday before. We live by lists. Start by looking at a calendar and take note of what you are going to do when. For instance, make sure to order your turkey well ahead of time so that you don’t have to worry about finding the right size and type the week of. We’ve found that you’ll want to account for about a pound and a half per person when buying your bird. You’ll also want to go through your drawers and cabinets to make sure that you have all the proper tools for the task. There’s nothing worse than realizing you don’t have a baster when your turkey is already in the oven. 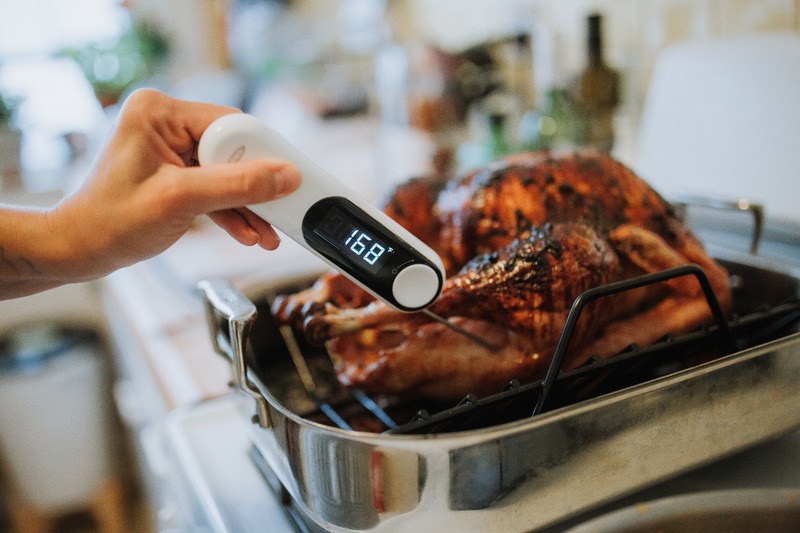 Luckily, all our stores (and our website) have all the Thanksgiving essentials you need: roasting pans, thermometers, carving sets, etc. 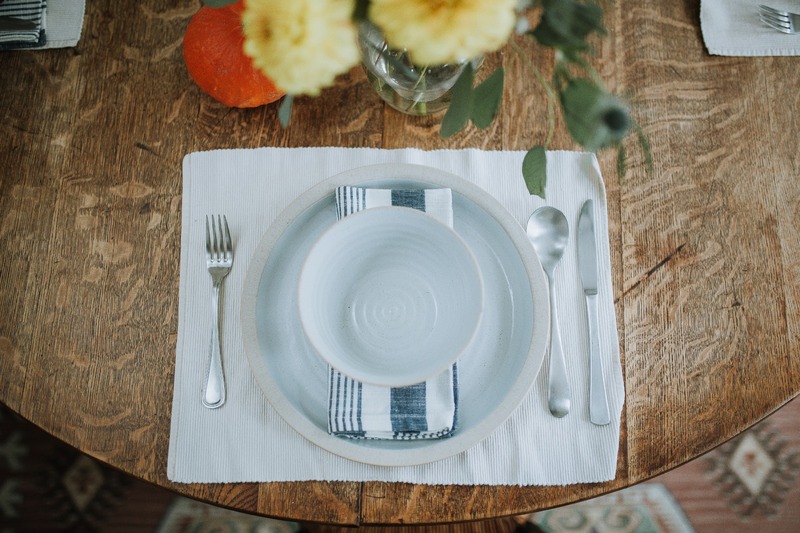 You’ll also want to go through linens and serving pieces to make sure you have enough for all your guests. Our favorite part of Thanksgiving is, of course, the meal plan. 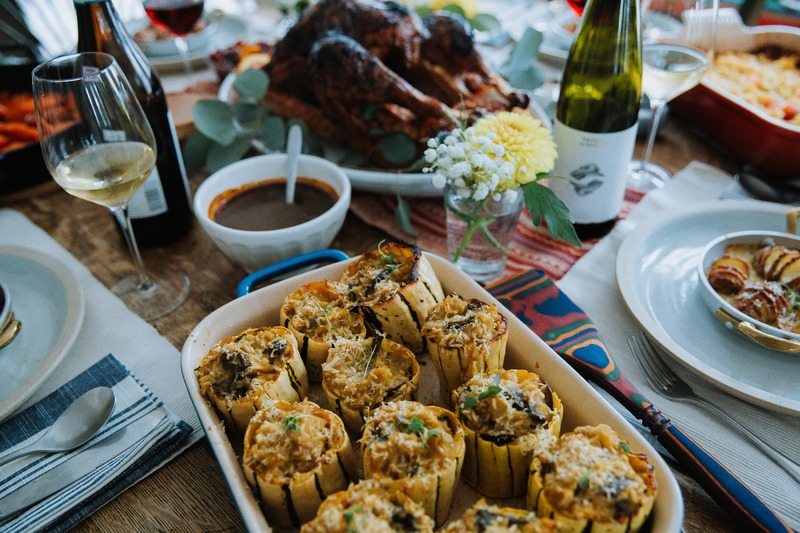 When it comes to planning your Thanksgiving menu, take time to consider how much oven space you have, how many people you’re serving, and if any of your guests have dietary restrictions. 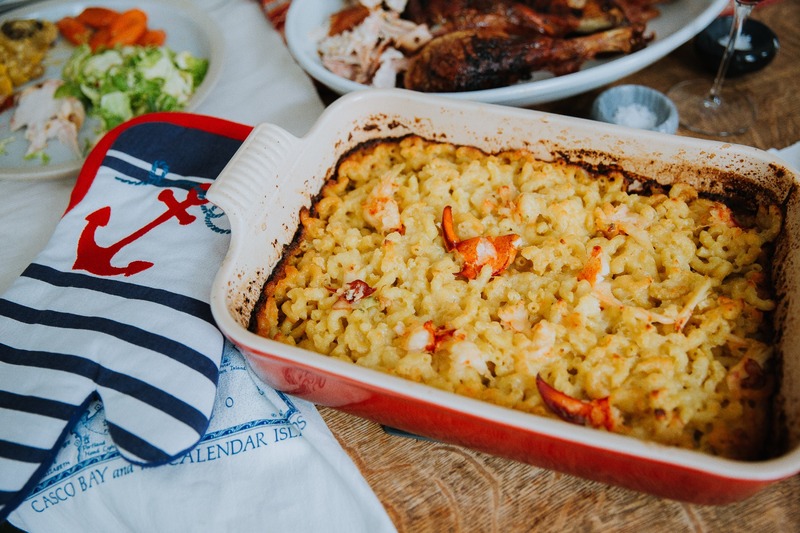 If you know you will have limited oven space, plan to make sides that can be served raw (like cold salads), made on the stove, in a slow cooker, or cooked ahead and quickly reheated. When planning our menu, we like to serve our favorite traditional recipes along with some fun new ones. Everybody has opinions about the stuffing and cranberry sauce, but you can have fun with veggie sides and potatoes. We always mix in some fresh, raw dishes, like a Brussel’s sprout slaw, to add some variety to the plate and keep the meal a bit lighter. 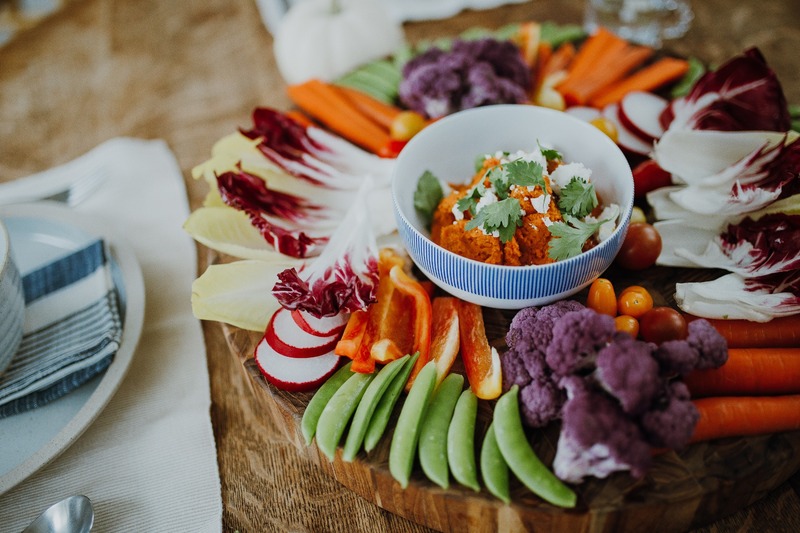 You’ll definitely want to check with your guests ahead of time to see if anyone has any special dietary needs. 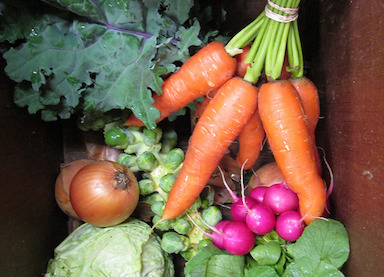 A good rule of thumb is to include at least one vegetarian option for the main dish. We love this stuffed squash with rice and mushrooms for a hearty, meatless main. 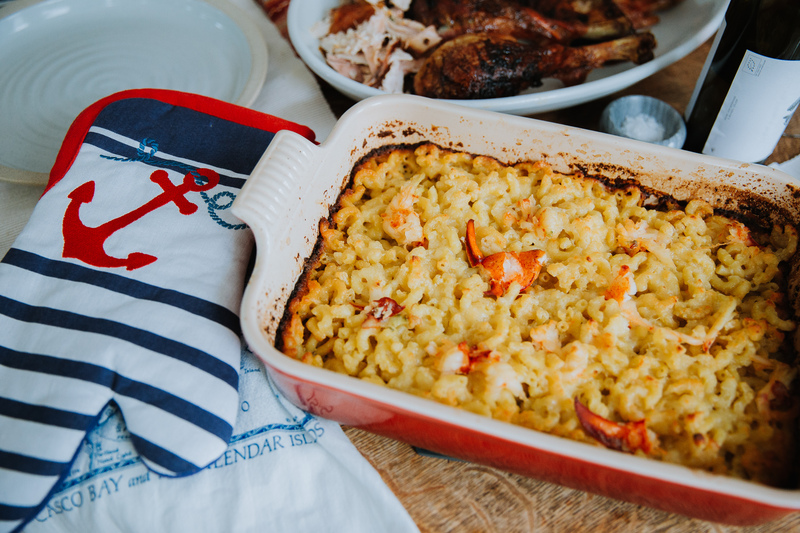 And while we know how tempting it can be to cook all the classics from scratch yourself, there’s no shame in asking family members to bring a side dish or pick up a pie from your local bakery. After all, this day is meant to be enjoyed with loved ones around the table and not solely in the kitchen. When it comes to beverages plan to offer a ‘house’ red, white and sparkling option and a big batch of a signature cocktail for guests to sip when they arrive. 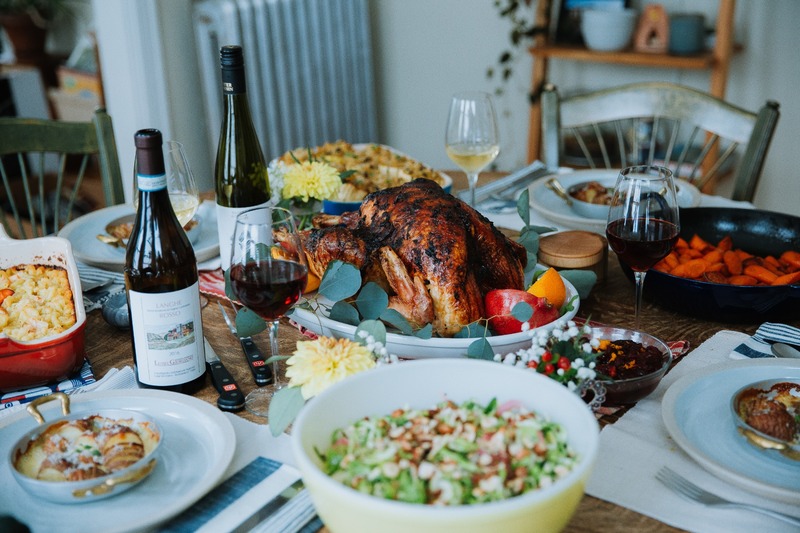 When we’re guiding customers towards selecting the right bottles of wine for Thanksgiving, we have some good rules of thumb to stick to. First, avoid anything too big and bold. 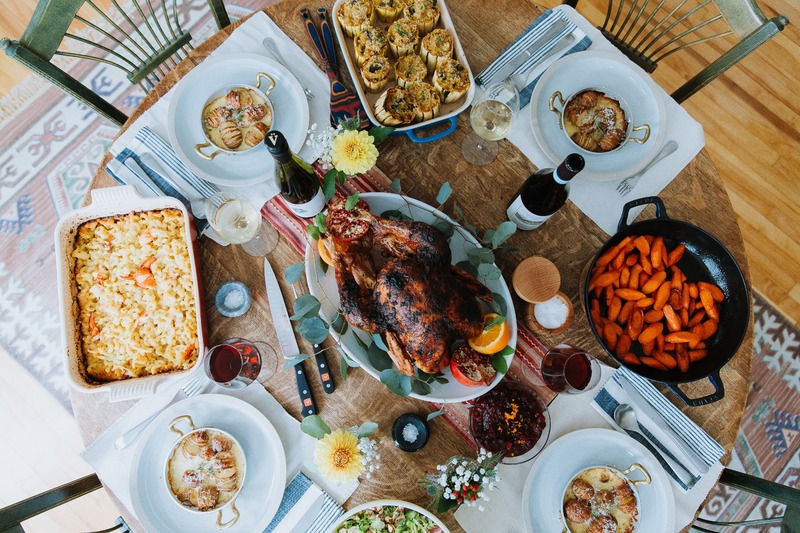 Thanksgiving comes with a spectrum of flavors, many of which are relatively bland (think turkey and mashed potatoes) but with good amounts of fat, as well as dishes that tend towards the sweeter side of things (squash, cranberry sauce, sweet potatoes). We want to let those flavors come through without being overpowered by whatever you’re drinking. 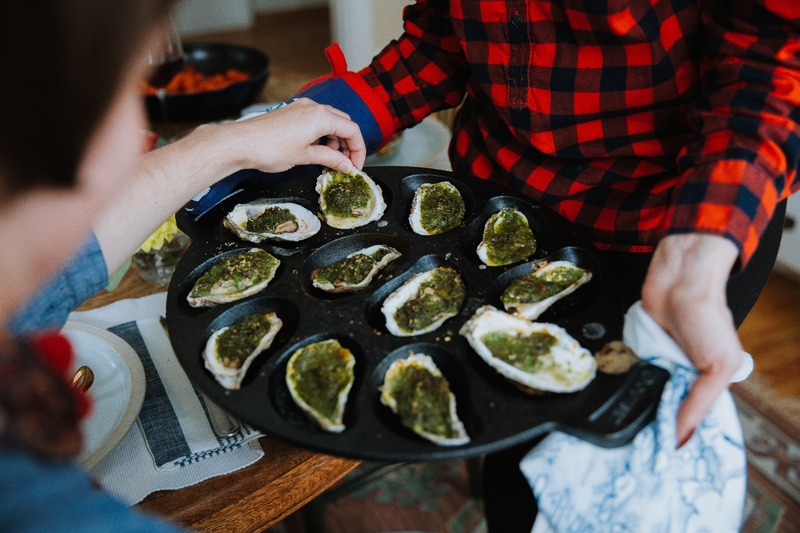 Light, juicy reds and zippy whites are perfect for playing second fiddle to the meal. Due to the aforementioned and undeniable fat content of this meal, you want a wine that has strong acidity. High acid in wine helps cleanse the palate and keep your taste buds ready for the next bite. High acid, lighter wines are generally lower in alcohol as well, so you can drink more (hooray!) without getting too full or drunk. 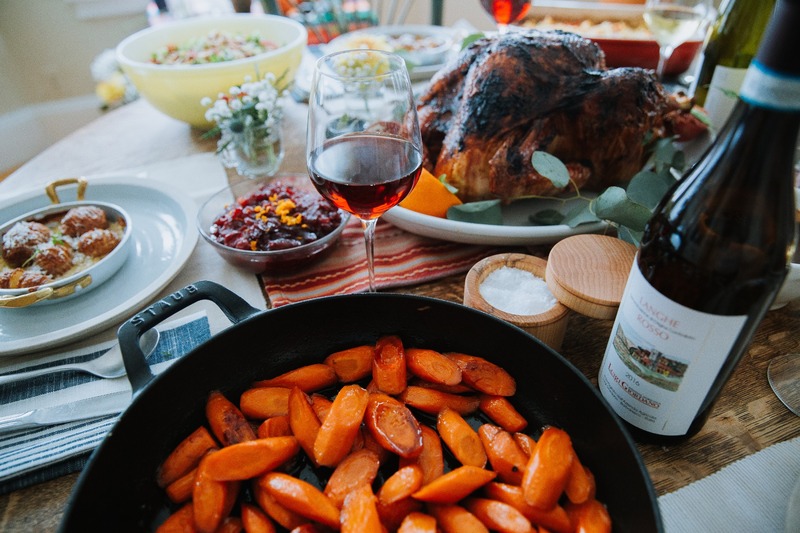 Some grapes that fall into these categories are Gamay, Pinot Noir, Rhone blends, Grenache, Loire Sauvignon Blanc, Riesling, Vouvray, Barbera, Pinot Gris, Gruner Veltliner, and Albarino. Choose a mix of reds and whites to drink through the day. 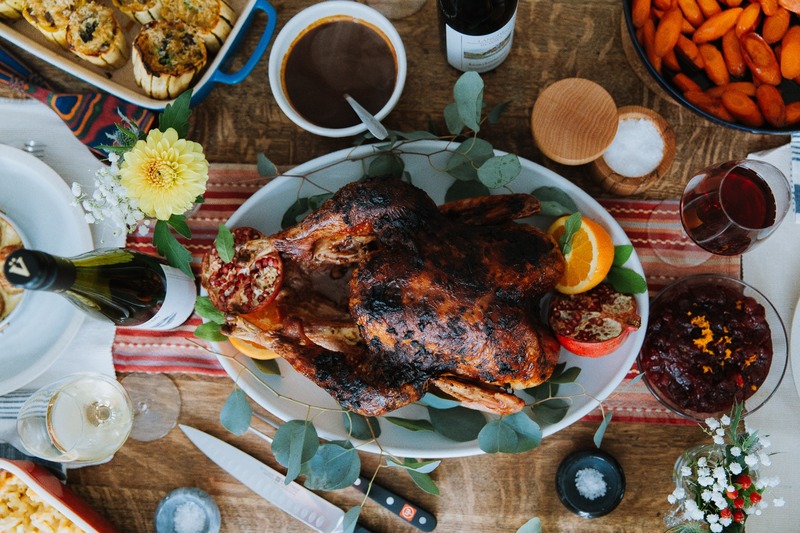 While the turkey may be the star of the show, the table is the turkey’s stage. 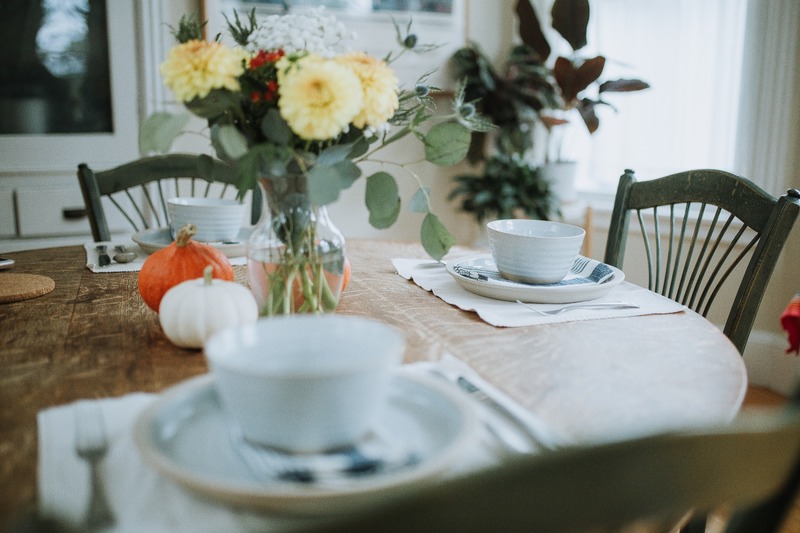 When it comes to styling a tablescape its good to remember that there is no “right” or “wrong” way to set a table. For instance, we kept it simple with soft blue linens and all-white porcelain. We wanted this table to have a light, natural feel so that the color of the dishes could really pop. Upon selecting your color palette, you can then decide what your centerpiece will be. A go-to will always be a floral arrangement. You can also play around with natural elements reminiscent of a harvest, like using wheat husks, or mini pumpkins and gourds. 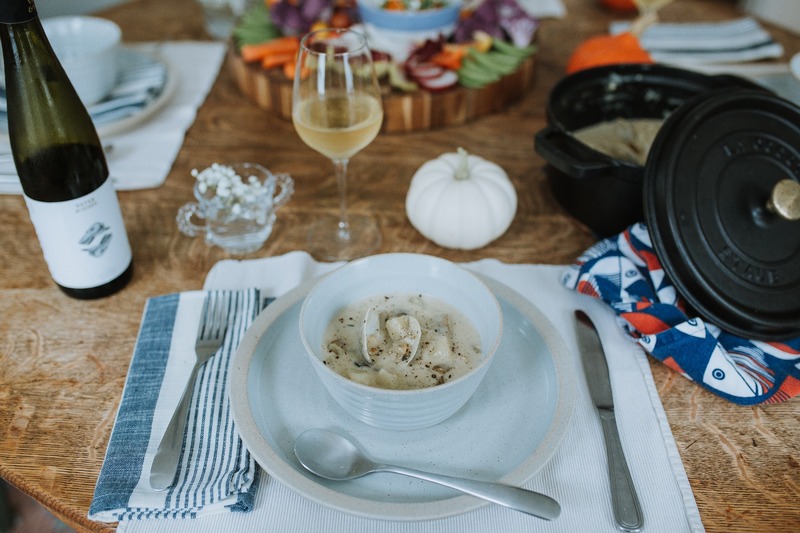 Whether you’re hosting the gathering or bringing a side dish, Thanksgiving can be stressful for everyone. Just remember, it’s just one day out of the year and the point is to have fun and be with loved ones. 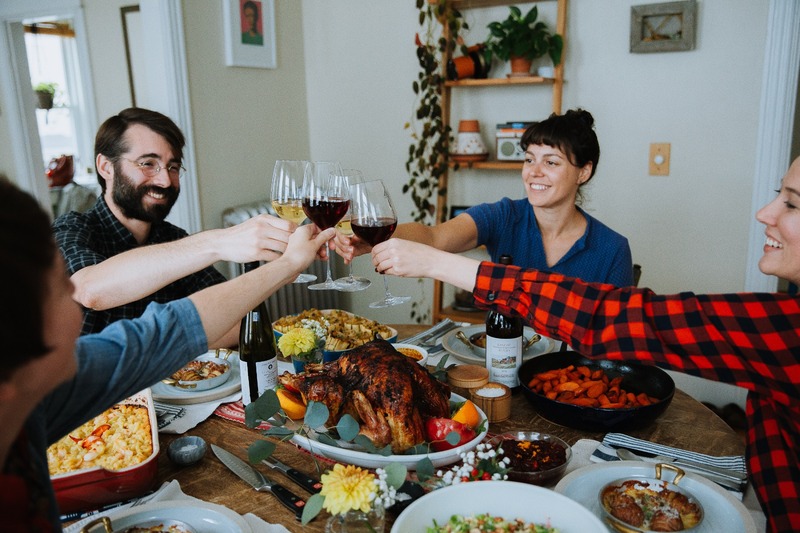 Even if things don’t go 100 percent according to plan or you burn the turkey, your friends and family aren’t just there because of the food, they’re there to spend time with the people they love.